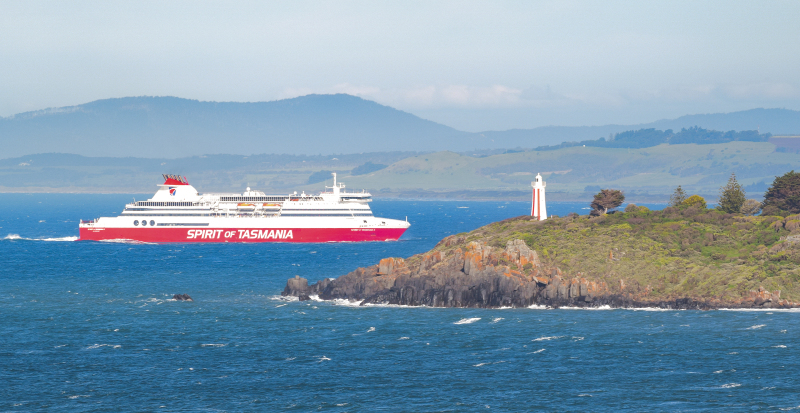 Spirit of Tasmania I enters Devonport, Australia as seen from Don Heads. Mersey Bluff in the foreground. Spirit of Tasmania I & II ferries, Searoad's Mersey and Tamar, Goliath and other cement carriers. Small chemical / product tankers (120 LOA) with tallow, caustic and fish oil as well as larger tankers with petroleum (183 LOA). Handysize bulk carriers with fertiliser and gypsum also call in as well as small LPG tankers. The Torquay / Spirit of Devonport passenger ferry pontoons provide a good unobstructed view of the turning basin, western berths and a close up view of passing ships. The pontoons are unlocked from 07:30am to 6pm. Depending on who's skipper and how busy it is, they may be able to take you down into the basin for some more close up shots for a $5 fare. The Harbour Master café is a short walk from the western pontoon. Adding more information, just testing links. A beautifull shot with the Mersey Bluff lighthouse too. Excellent pic AND description Cody! I hope Vlad is just one of many members who are prepared to share their knowledge.